Fire Point is a First Person MR simulator, built around helping firefighters explain and display what their daily work environment is like but without putting anyone at risk. We are currently using the latest in MR (HoloLens & Windows Mixed Reality) technology to help bring the experience forward in the best possible way. The simulator allows you to see through the eyes of a firefighter as you make your way through the multi-storey training ground but with a variety of different encounters to tackle and try to master your skill as a firefighter. The main purpose behind the idea was, that we felt the emergency service needed a hand in using the latest pieces of technology (VR, MR & AR) but at the same time have something fun and entertaining to use. The plan is for the simulator to be used at open days or recruitment days so they are able to visually show off what it is like to train as a professional, whilst allowing individuals to give it a try and test their skills. An Abertay University student games development team is preparing to take on the best in the world at the finals of the Microsoft Imagine Cup in Seattle. Blacklight Games is made up of third year students Matthew McAuley, Marc Ubach Martinez, Emily Peterson, Calvin Angove, Alice Firth, Craig Metcalfe, Liam French and Hamish Blackwood. 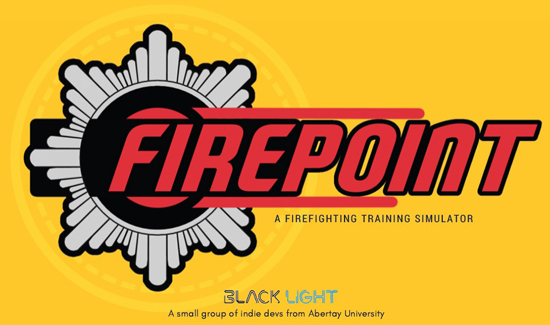 As part of a coursework exercise, the team - which features programmers, artists, games designers and sound engineers - has created Firepoint, a first-person mixed reality simulator which aims to bring a new level of realism to firefighter training. Using HoloLens and Windows Mixed Reality technology, the game allows trainees to see through the eyes of a firefighter as they make their way through a multi-storey training ground tackling a variety of different issues. It is hoped the simulator can eventually be used at open days or recruitment fairs. In April the team made the UK finals of the Microsoft Imagine Cup in London, which seeks out the most innovative and potentially world-changing software solutions. They will now travel to Seattle in July to take on teams from across the world, with a prize of $100,000 at stake. It is the fourth year in a row an Abertay team has made the UK finals of the contest and the second consecutive year at the world finals. Matt said: “We wanted to use technology to help provide training for different scenarios. The trainer can give feedback as they are moving through the world and it gives an idea of what they would be facing in real life. “It’s immersive and gets them ready for real training. Microsoft really saw the potential in it, particularly the potential to improve response times and how it could be used for training in different building situations. “We are now going to narrow the game down and look at spatial mapping to see if we can make the game more real, based on real environments and make it a really polished product. “We were shell-shocked to make the final – it’s absolutely amazing. “This project has been real fun and to go to the Imagine Cup and make it through to Seattle is incredible.